CooksRecipes has quality, kitchen-tested recipes for a variety of baked egg dishes, perfect for breakfast, brunch or supper, that you can count on for successful deliciousness. 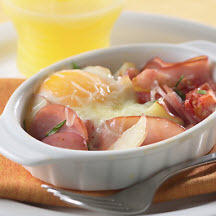 A delicious and hearty way to start your morning is with this baked egg dish, practically a complete country breakfast. 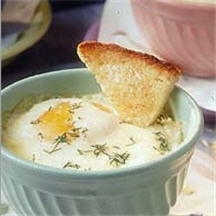 Tender baked egg in cream and Havarti cheese, seasoned with dill. 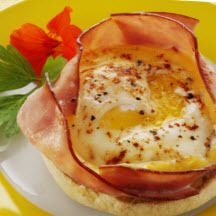 Baked eggs with ham and cheese served atop toasted English muffins. A complete breakfast perfect for brunch.